Home in time for tea! : Oooh, a snowy cookie! The snow has finally begun to disappear (for us at least, and for now...?) and unfortunately no snow day for me. For a train service that runs shockingly badly a vast proportion of the time, First Capital Connect actually managed to run services in and out of London with a decent amount of frequency. Damn. I really wanted a snow day. Anyway, talking of snow that seems like a great segue to another one of the Christmas recipes, Pfeffernusse, more German spiced cookies except these ones look like they've been dusted with snow! 1. Start by making the spiced sugar (although you could equally do this while the cookie dough is is the fridge). Sift all ingredients together into a large bowl; set aside. 2. Then move onto the cookies themselves....Sift together flour, cinnamon, baking soda, baking powder, ginger, nutmeg, salt, mixed spice, and pepper into a large bowl; set aside. 3. Place the almonds in the bowl of a food processor fitted with a blade attachment and process until finely ground, about 25 to 30 seconds. Add the almonds to the flour mixture and stir to combine; set aside (to be honest, I see no reason why you wouldn't just buy ready ground almonds to save a bit of time!). 4. Place the butter, lemon zest, and orange zest in the bowl of a stand mixer fitted with a paddle attachment and beat on medium speed until fluffy and combined, about 1 minute. Add the brown sugar and beat until incorporated and lightened in colour, about 1 minute. Add the egg and beat until incorporated, about 30 seconds more. Add the honey and candied lemon or orange peel (or mixture thereof) and beat until just incorporated, about 1 minute. Stop the mixer and scrape down the sides of the bowl and the paddle with a rubber spatula. 5. 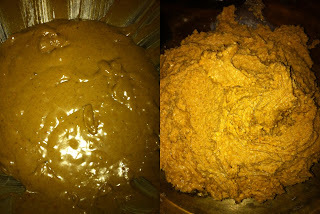 With the mixer on low, add the flour mixture in three additions, mixing until just combined, about 1 1/2 minutes total. (Do not over mix.) Cover and refrigerate the dough until firm, at least 1 hour (go wrap some presents, watch some tv, have a glass of wine...make more German cookies...). 6. Heat the oven to 350°F and arrange 2 racks to divide the oven into thirds. Line 2 baking sheets with parchment paper; set aside. 7. Roll the chilled dough into 24 (3/4-inch) balls and space them 1 1/2 inches apart on the prepared baking sheets. Bake the cookies for 8 minutes, then rotate the sheets from front to back and top to bottom. Continue baking until the cookies are very lightly browned around the edges, about 5 to 6 minutes more. (The tops will be soft, but they will firm up as the cookies stand.) Transfer the baking sheets to 2 wire racks and let the cookies sit until cool enough to handle but still warm, about 3 minutes. 8. Drop the warm cookies into the spiced sugar, making sure to coat them all over, then shake off any excess sugar and transfer to a wire rack to cool completely. 9. Repeat baking and sugarcoating with the remaining dough. Store the cookies in an airtight container, layered between pieces of waxed paper, for up to 3 weeks (if they last that long!). So yes, another batch of yummy cookies. Bueno. * Not sure what to do with the now naked orange and lemons and the bells of St Clements are nowhere nearby? Why not make this little aperitif to go with your cookies? ?